To manage State Trust lands and resources to enhance value and optimize economic return for the Trust beneficiaries, consistent with sound business management principles, prudent stewardship, and conservation needs supporting socioeconomic goals for citizens here today and future generations. To act in the best interest of The Trust for the enrichment of the beneficiaries and preserve the long term value of the State’s Trust lands. 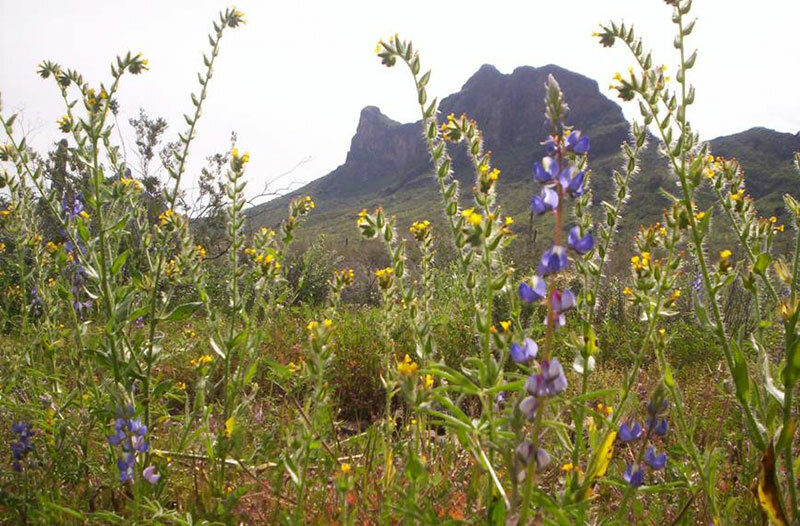 State trust lands near Picacho Peak State Park. Photo Credit: Diana Rhoades. Arizona trust lands are scattered throughout the state, with the majority of the lands found in rural areas of the state. A large portion of Arizona’s trust lands (nearly 2.3 million acres) are found in a checkerboard pattern with federal and private lands. This is largely a legacy of the railroad land grants, where every other section of land along railroad rights of way was conveyed to private interests as repayment for construction of railroads through the West. The interspersed federal lands later became part of the trust land conveyance to the state. Many of the lands within the Verde River watershed are found in this checkerboard pattern, particularly the 6,200 acres of land in the Verde River headwaters region. These lands present a management challenge for both the trust land managers and the private landowners, but in most cases, checkerboarded state trust lands are leased for grazing to the owner of the interspersed private lands, with little in the way of competition. The majority of state trust lands in Arizona – nearly 84% – are leased for grazing and agriculture. However, the lion’s share of revenue generated from state trust lands in Arizona is gained through sale of state trust lands for development. There are approximately one million acres of state trust lands located adjacent to or within fast-growing urban metro areas, and these are the lands that are prioritized for sale because they bring in the highest price per acre to the trust. Since statehood, over a million acres of Arizona state trust lands have passed into private ownership through sales. State trust lands in Arizona, shown in light blue. Photo Credit: Arizona State Land Department. Arizona’s Enabling Act is considered one of the most restrictive in its prescriptions for how state trust lands are to be managed and sold. The provisions prohibit the mortgage or encumbrance of state trust lands, and require that trust lands and any natural products obtained from them be sold or leased “to the highest bidder at public auction.” Minimum standards for auctions, including notice, advertising, and location of auctions, are also prescribed in the Enabling Act. Trust land management activities are typically divided into three types: surface uses, subsurface uses, and sales. Surface uses comprise the largest portion of trust land activities, and are primarily grazing, agriculture, commercial leases, and rights-of-way. Grazing and agricultural leases are managed through short term, ten-year lease programs. While leases are required to be bid competitively at auction, the ASLD may give existing short-term grazing lease holders a “preference right” if they are in good standing on their lease. Commercial leases may be awarded anywhere from ten-year lease terms to 99-year lease terms, and these leases must go through competitive bid at auction and be awarded to the “highest and best bidder.” Subsurface uses encompass mineral development and mining activities on state trust lands. Mineral leases on state trust lands are awarded at auction for twenty-year periods, along with a requirement for payment of royalties to the ASLD. Sale of state trust land is by far the largest revenue generator for the trust, in some years accounting for over 80% of total revenue generated by state trust lands. Sales are governed by a complex set of rules and requirements laid out in the Arizona Enabling Act and Constitution, as well as the Urban Land Act and Growing Smarter legislation. The Enabling Act and Constitution require that trust lands be sold to the “highest and best bidder at a public auction,” and furthermore require that lands be sold for no less than their “true value” or fair market appraised value. 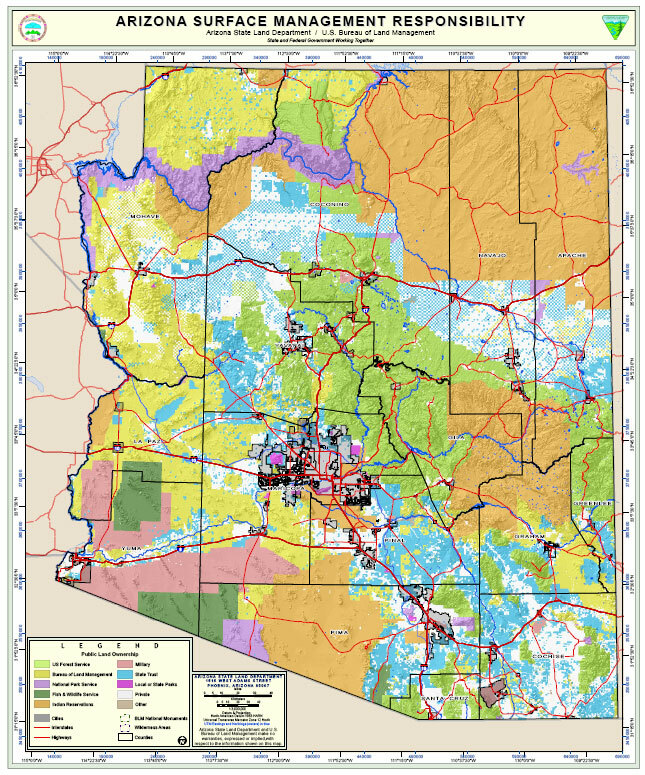 The Urban Land Act, passed by the state legislature in 1980, and the Growing Smarter legislation, adopted in 1998 and 2000, provide further detailed guidelines for the planning and disposition of state trust lands in Arizona. These measures require a conceptual planning process where trust lands are evaluated, identified as suitable for development, and planned for disposition (sale). In considering the suitability of state trust lands for sale, the ASLD evaluates a variety of factors, including water and infrastructure availability, proximity to existing development, whether the development of the parcel will be beneficial to the trust overall, and a range of other considerations. While K-12 public education is by far the largest beneficiary of trust lands revenues, receiving the benefits from 8.1 million acres of the 9.2 million acres of state trust lands in Arizona, there are a total of 14 public institutions that also receive benefits from trust lands. Other beneficiaries include state penitentiaries, two miner’s hospitals, the Arizona State Hospital, the School for the Deaf and Blind, and legislative, executive and judicial buildings. Revenues generated by state trust lands are classified as either “permanent” funds or “expendable” revenues. Revenues from the sale of state trust lands or natural products (such as minerals) are classified as permanent, and deposited into a permanent fund. The Arizona Constitution establishes a separate permanent fund for each beneficiary. Revenues from lease rentals are considered “expendable” and are passed directly on to the beneficiaries for their use. The use of land exchange authority in connection with state trust lands has an interesting history in Arizona. It was a tool that was frequently used by the ASLD and other parties prior to 1990, and the use of land exchanges enabled the state to consolidate large-scale contiguous holdings, which were much more valuable for the trust, out of the largely checkerboarded lands. However, land exchange authority was struck down for the ASLD by a 1990 state Supreme Court decision determining that exchanges violated the state Constitution and Enabling Act provisions for disposition of state trust lands. After many attempts to pass a constitutional amendment to authorize land exchanges for state trust lands, a measure finally passed in 2012 that gave the ASLD limited authority to engage in state trust land exchanges if the following conditions were satisfied: the other entity involved in the exchange was a federal agency; and the exchanges were completed to protect military installations, achieve conservation or other public purposes, or were otherwise found to be in the best interests of the trust. The concepts of fiduciary duty for intergenerational trusts continue to evolve, and recently have begun to support concepts of sustainability, environmental value, and long term management for the health and commensurate economic productivity of those land assets. An increasing number of trust land managers are beginning to plan for long-term income generation, manage some of their land holdings in a way that will ensure their sustained health and economic productivity for generations to come, and identify trust lands that belong in such long-term asset classes. However, even when trust land agencies acknowledge the consistency between their fiduciary mandate and long term management of lands for health and productivity, the tools available to manage trust lands in this manner in Arizona are incomplete or absent. The only concrete tool available in the state that recognizes the value of trust lands beyond that of simple resource extraction and revenue generation is the Arizona Preserve Initiative (API). API, however, is a somewhat limited and simplistic mechanism, by which trust lands identified as having conservation values can be made available for purchase by conservation buyers at market value. Furthermore, the program’s constitutionality has been called into question by the strict interpretation of trust provisions in Arizona law. However, while the constitutional authorities provided to state trust lands managers in Arizona are among the most restrictive in the U.S., considerable deference and discretion in managing the trust portfolio to meet the trust responsibility is given to the State Land Commissioner. This creates an opportunity to explore innovative practices that can expand the range of tools and strategies for long-term management of state trust lands. And in some cases, ecological values can be protected through existing tools available to trust land managers if used purposefully in the appropriate context. Trust land management in Arizona has evolved significantly over the past century since the lands were first conveyed to the state. Traditional uses, such as grazing, agriculture, mining, and logging have been overshadowed by the remarkable revenue generating potential of real estate development in the urban areas. Typically, the ASLD sells no more than 2,000 or 3,000 acres per year when the market is at its most heated, and yet these few acres generate the vast majority of trust land revenues. In recent years, sales of land for conservation purposes through the Arizona Preserve Initiative, exploration of ecosystem service markets, lease of trust lands for renewable energy development, and other efforts to diversify the revenue stream for state trust lands have emerged. As the trust works to meet the needs of beneficiaries far into the future, trust activities will also continue to evolve and mature.